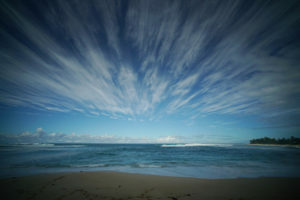 A broad black cloth drapes down the steep slope from Richard Sterman’s grassy backyard to the sandy beach at Pupukea. Navigating the straps he tied to keep his two remaining palms somewhat upright, he explains the benefits of the “skirt” that he and dozens of North Shore homeowners have deployed to prevent their properties from slipping into the sea. He’s lost 10 feet of lawn in recent years from chronic coastal erosion. Some have lost more. The surf is insatiable, eating the land out from under them — farther and farther inland as sea levels rise and storms batter the shoreline with increasing frequency. The geotextile fabric is a Band-Aid on an escalating problem that has left longtime residents desperately searching for help as policymakers ponder longterm solutions in the face of a changing climate. Homeowners have run up against state and county policies that have made taking action hard, slow or confusing. 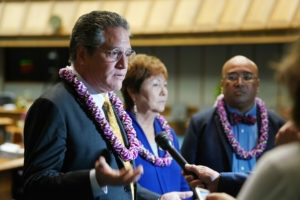 Lawmakers seem more interested in protecting Waikiki and Honolulu’s urban core than rural coastal homes, many of them owned by middle-class families who have lived on the coast for generations. 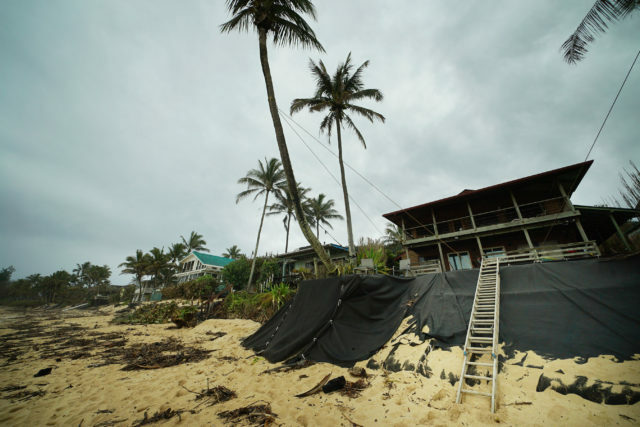 An extension ladder, leaned against a geotextile fabric to slow erosion, provides access to the beach from Richard Sterman’s home in Pupukea. Maureen Malanaphy, a retired public school teacher, has been fighting a similar battle 15 miles around the bend in Hauula. Her Band-Aid is concrete and dirt. Sinkholes up to 5 feet deep and 15 feet wide have been the bane of her existence the past several years. Storms don’t even have to make landfall to cause them. Six named cyclones spun near the islands last year, one of the most destructive hurricane seasons on record. 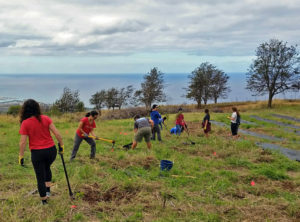 Hurricane Norman only came within a few hundred miles of Oahu last September, but it was close enough to create another trench in Malanaphy’s small backyard. On a recent Monday afternoon, she points at the holes she’s filled in the yard and the patches she’s made to the brick seawall that has guarded her home since before she moved in 38 years ago. The old wall is the only reason her home is still there, she says. 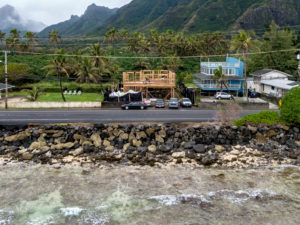 Wealthy foreign investors and U.S. mainland speculators have snatched up many of the oceanfront properties in Hawaii, turning them into second homes or vacation rentals for the hordes of tourists who come to experience the islands each year. But there are also many homes still owned by longtime middle-class residents who bought them before prices skyrocketed or inherited properties from relatives at a time when global warming was discussed more in scientific journals than on international stages as the biggest crisis of our time. Sterman and Malanaphy raised their families in these homes and had planned to live out their retirement years there. Now that dream is vanishing, and they aren’t sure what to do. What’s legal and what’s not? What are the best practices and what’s a waste of money? What’s the plan for folks without millions of dollars or political clout? 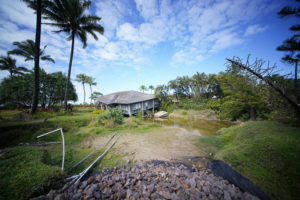 Climate scientists expect more than $20 billion in ruined buildings and roads around Hawaii as sea levels rise a projected 3 feet by the end of this century. 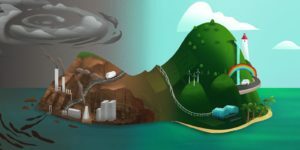 It’s a primary driver in the state’s shifting shorelines, coupled with more frequent storms, chronic flooding, overuse of infrastructure and misuse of resources. Not everyone who lives on the North Shore thinks climate change is causing the erosion — including Sterman. He faults an uptick in storms, cyclical weather phenomena and the throngs of people who trample the dunes that naturally buffer coastal homes — and a failure by the state to manage the erosion. 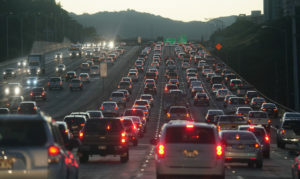 A record 10 million tourists are predicted this year alone for Hawaii. 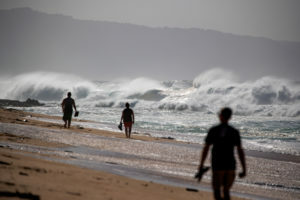 Many of those are expected to visit the North Shore’s iconic sites like Ehukai Beach Park, the legendary surf spot known as Banzai Pipeline that’s a short walk from Sterman’s place. Malanaphy, and some of her neighbors, agree with the scientific consensus around climate change and blames its myriad effects on the threats her property faces. “The climate has been really wacky,” she says. 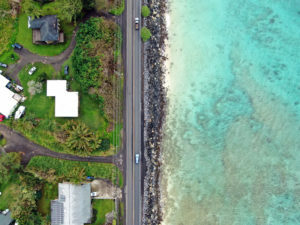 The differing views on the causes of the unprecedented changes that oceanfront property owners are experiencing only matter so much in the here and now. Residents along the coast are dealing with many of the same problems and taking similar steps to prepare for the situation to worsen. In the meantime, crews are building at least two new homes along the highway in Kaaawa, just down the way from Malanaphy. Flooding has frequently shut down this stretch of highway. Waves overcome the rocky revetment protecting the road in front of the homes’ wooden skeletons. Sterman says the skirt he is using has slowed the rate of erosion in front of his home. It absorbs the wave action and protects the loose sand and soil underneath it. The black cloth didn’t cost much and it’s easily removable. He’s lost 10 feet of private lawn but has faith in the public beach building back up. The sand has come and gone over the years — 200 feet wide some seasons, 20 feet at other times. The drop-off from the edge of his backyard to the beach is 10 feet this week, but has been 25 feet. "Tourists, tour vans pulling up, they're wearing out the sand dunes." Sterman has worked almost 40 years in real estate since graduating from the University of Hawaii. 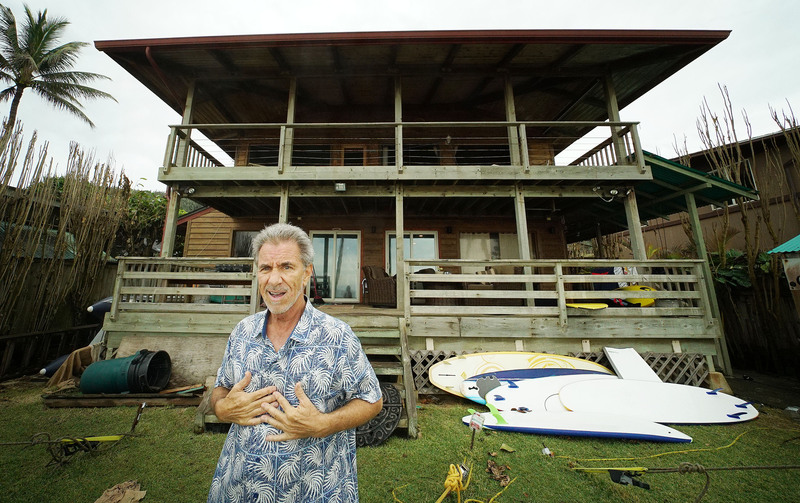 His office is 5 miles down the road in Haleiwa. It took him decades to afford his dream home in Pupukea, a community of about 4,500 people where the median household income is $87,000. He bought the home in 1998 for $385,000. The 2,300-square-foot home, built in 1990, is now worth $3 million, according to this year’s tax assessment. Sterman is literally a stone’s throw from one of Oahu’s best surf breaks. World-renowned surfers and others use the extension ladder he has leaning against the embankment to access the shoreline. His four kids grew up there, playing in the waves and attending Waialua and Kahuku high schools. Sterman says implementing the right coastal management program won’t just save his property, but everything behind it — other homes, a bike path, the highway. To him, that means empowering homeowners to protect their properties with skirts, angled revetments or other methods more gentle than vertical seawalls. So far, the skirts are OK with the coastal authorities but more permanent structures are either banned or need special permits. 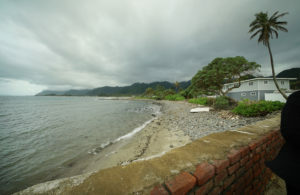 He doesn’t want to see the North Shore turn into a place like Kahala or parts of windward Oahu that have lost their beaches from hardening the shoreline so severely that it stops any semblance of the natural movement of sand. “I don’t know what the solution is longterm, but I would say it has a lot to do with the state and Department of Land and Natural Resources working together with the homeowners to preserve the oceanfront properties,” he says. Like his neighbors, Sterman’s biggest beef is with local government’s so-called managed retreat plan. 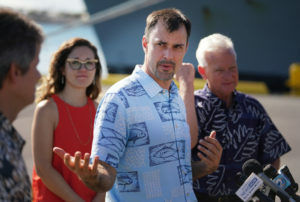 City and state officials seem more inclined to step in to save Waikiki and Honolulu from rising seas, erosion and flooding by spending millions or likely billions of dollars on raising streets, armoring the coast and perpetually replenishing south shore beaches. They argue that the state’s economy depends on it. But they appear less apt, based on public statements and policy documents, to do the same for rural areas outside the urban core. That’s where they envision managed retreat, a plan to move residents, roads and businesses systematically away from the shore. But it remains unclear how government would incentivize this or who would ultimately bear the financial burden. The state released a report earlier this month that sheds light on some of the critical factors to consider when implementing a managed retreat strategy. But it doesn’t spell out what homeowners should do now, as was initially envisioned. The report underscores that this is one of three main options to adapt to sea level rise and related effects of climate change. Flood-proofing or elevating homes is another option. Protection is a third choice, which could involve seawalls, dune restoration and beach renourishment. Sterman and about 40 North Shore homeowners have recently formed the Oceanfront Preservation Association to figure out how to tackle these issues. Sea level rise is a background concern to other residents in the area. 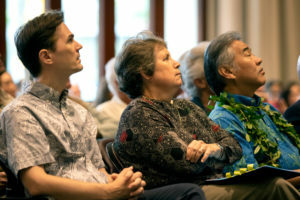 The North Shore Neighborhood Board heard more complaints last year about crime, air traffic, a missing fire hydrant at Haleiwa Elementary, leaking showers at Waimea Bay and unsightly windmills. Malanaphy is a single mom on a mostly fixed income. 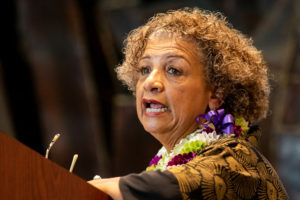 While retired from the Hawaii Department of Education, she still substitute teaches to bring in extra money — funds she’d rather not spend on sinkholes and seawall repairs. She and her then-husband bought the 1,400-square-foot wooden home in 1980 for $118,000. Built in 1963, it’s now valued at $565,000, according to her 2019 tax assessment. Hauula is a small community of about 4,100 residents. The average household income is about $93,000, according to census data. 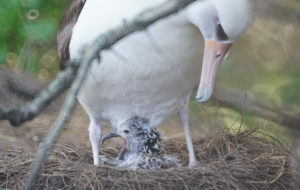 Given the cost of living, that’s still considered low income for a family of four in Hawaii, according to the U.S. Department of Housing and Urban Development. Like other parts of windward Oahu and the North Shore, it’s desired for its lack of development and easygoing pace. A Hawaiian flag and sign reading “WATCH FOR KID’Z” urges drivers to slow down as you turn onto the looping road that leads to Malanaphy’s home. “I’ve always felt I wanted to live here forever. I love this place,” Malanaphy says, looking out from her backyard at the Koolau Mountains and waves lapping at the rocky shoreline. Some of Malanaphy’s neighbors are already actively searching for homes farther inland. Others have turned their properties into vacation rentals. She noticed changes in the weather patterns about seven years ago. The storms have become more frequent, flooding more intense. Three roads closed last fall when the water covered Kamehameha Highway, the only route in or out of Hauula. She’s started budgeting several thousand dollars for annual repair work to her yard. The sinkholes and seawall repairs aren’t covered by her flood insurance. She ultimately wants greater awareness about the problems with sea level rise. 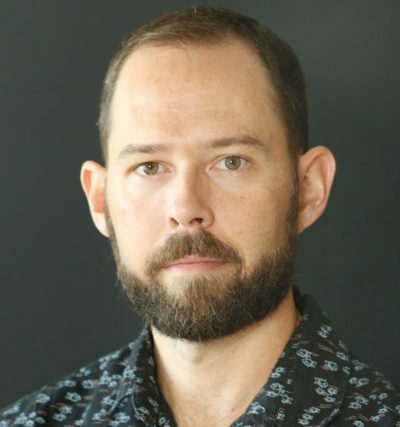 University of Hawaii climate scientist Chip Fletcher has been researching sea level rise and issues related to global warming for almost 30 years. He helped develop the 304-page Sea Level Rise Vulnerability and Adaptation Report, which the state climate commission adopted. The Legislature is considering bills again this session to give its recommendations teeth. 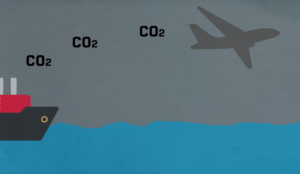 The science does not present a postcard picture for coastal residents. Fletcher hears their concerns regularly, steers them to online mapping tools to help guide their planning efforts and explains the jurisdictional regime between the city and county and state. He explains the current thinking on sea level rise and seawalls, but he’s blunt in his assessment. To him, managing erosion is a misplaced concept that amounts to messing with the lifeblood of a beach. Vertical seawalls, sloping revetments, geotextile cloths will all help stop erosion, Fletcher says. Some are better than others, but he says they will eventually cause longterm beach narrowing and beach loss. The geotextile cloths, or skirts, are useful because they are not a permanent solution, he says. But that’s also the problem — it’s just buying time.